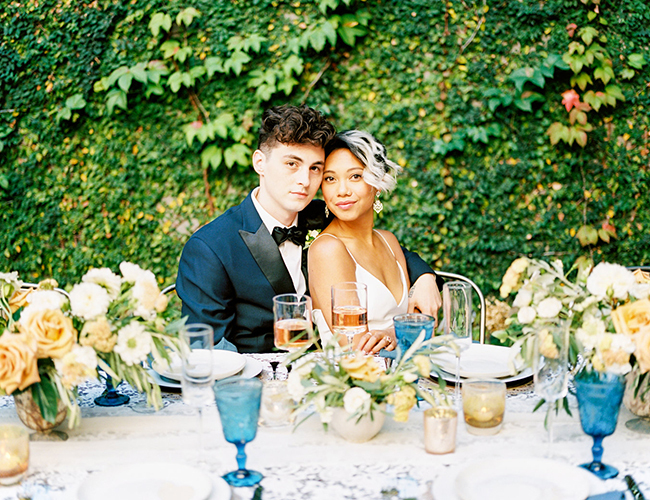 This inspiration shoot is full of modern, glam details and a fun color palette that makes it feel totally fresh and inspiring! 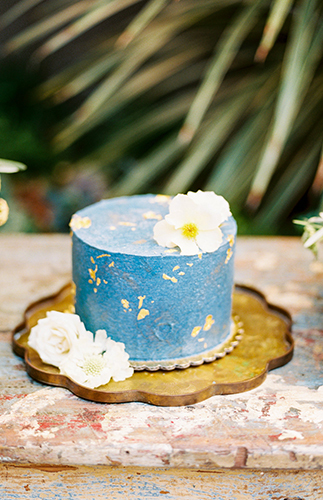 Andria Leigh Events dreamt up the blue and gold wedding inspiration and executed it flawlessly with the help of some pretty amazing vendors. 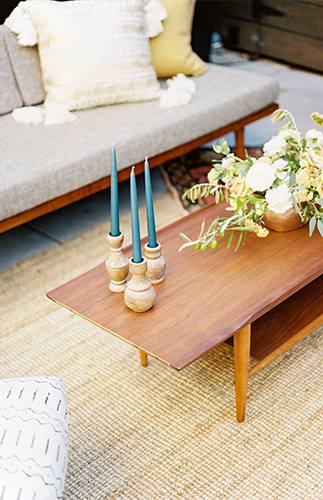 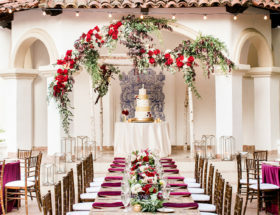 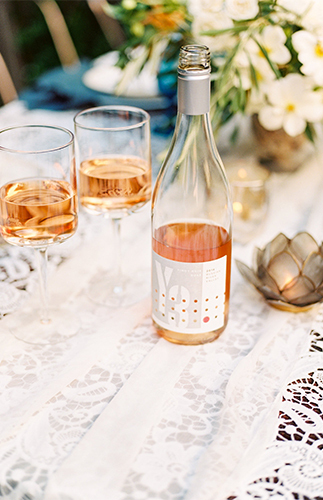 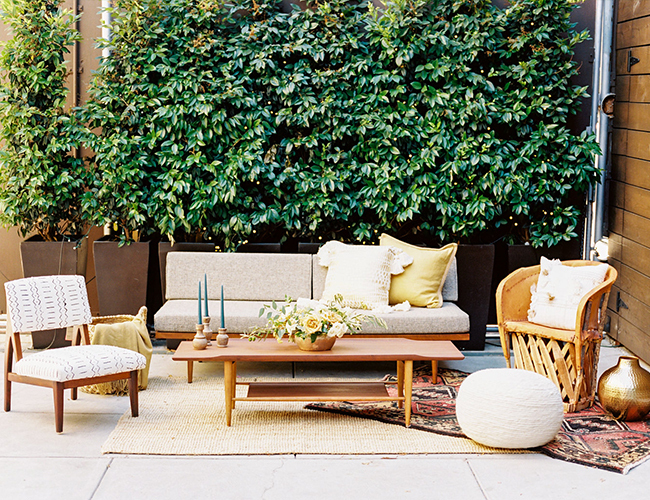 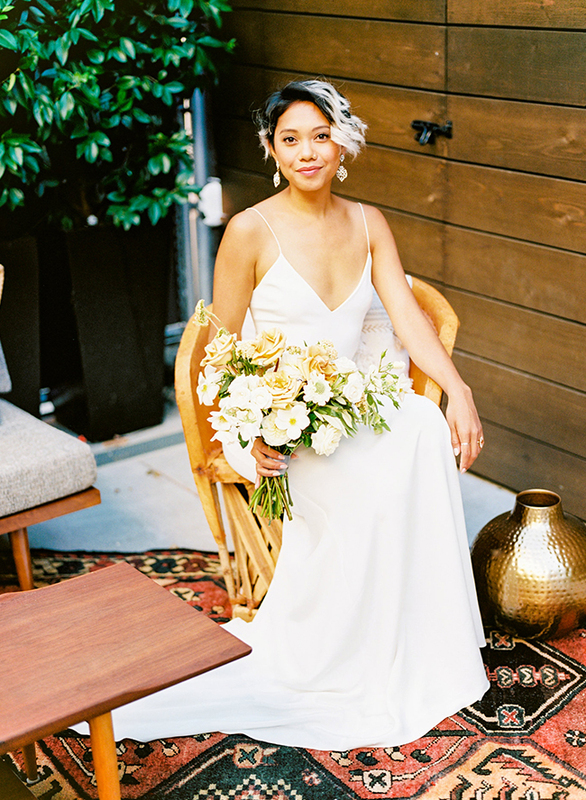 Together, they created a truly dreamy set up any bride would love. 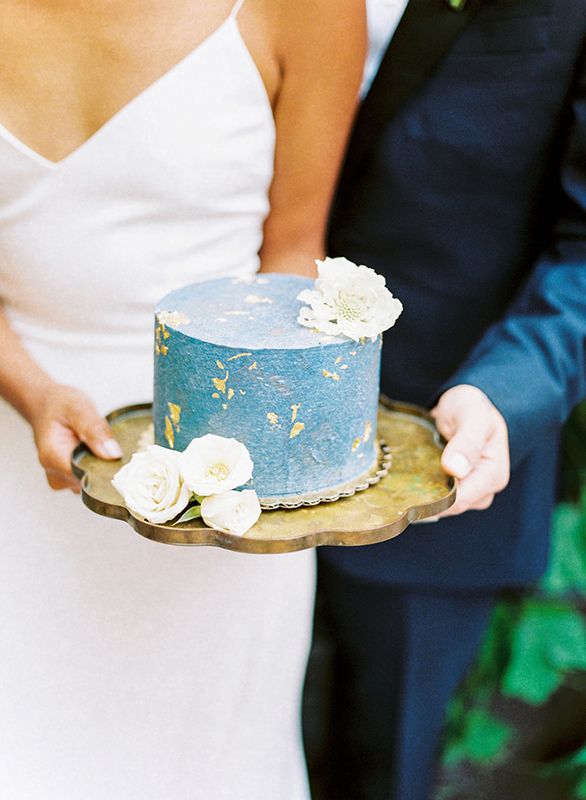 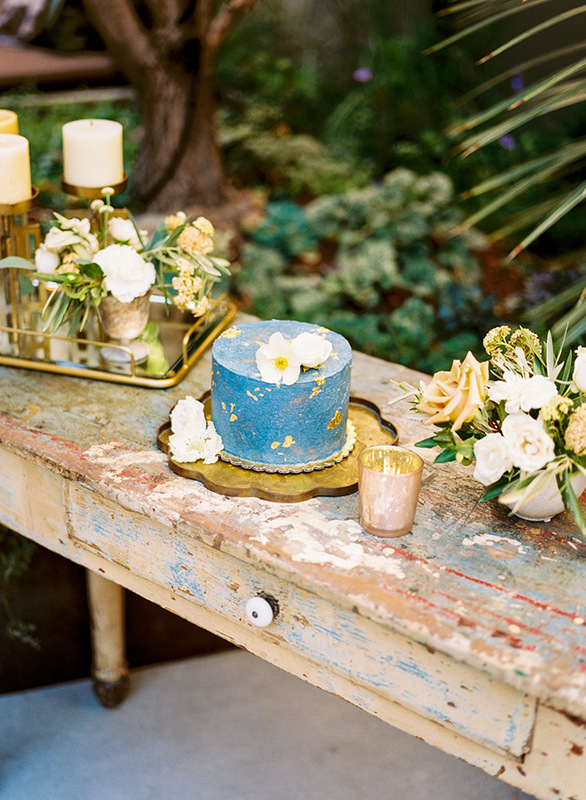 We’re particularly a fan of the mid-century-esque cocktail lounge, the single tier cake adorned with gold foil, and the lush whimsical florals! 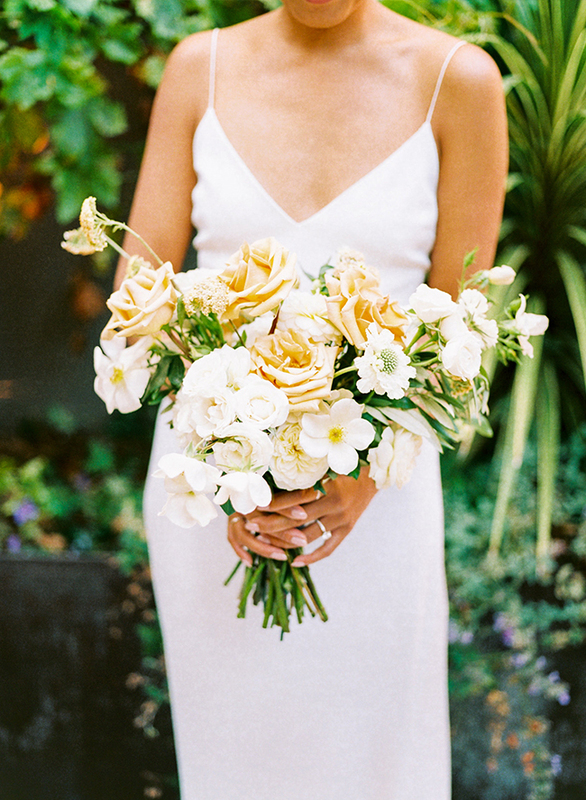 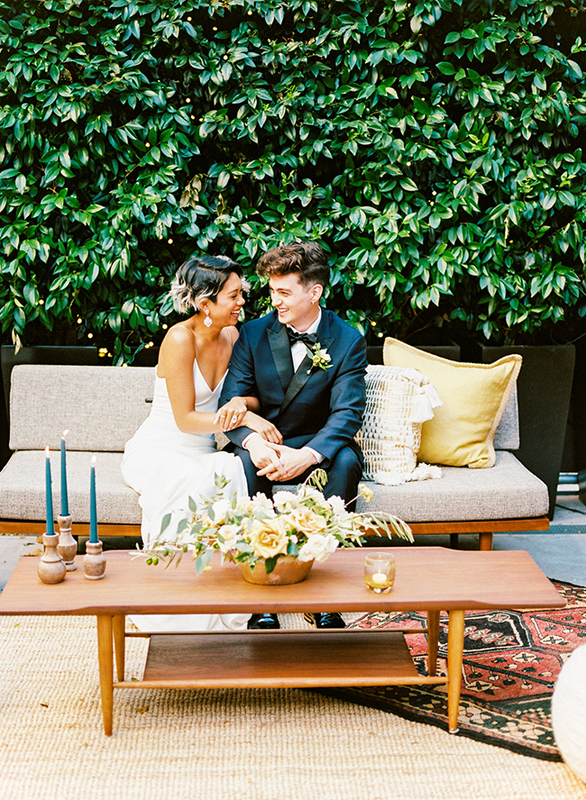 Andria says, Our intimate reception shoot took place at JAX vineyards, a cozy tasting room tucked away in the streets of San Francisco, just south of Market St. With a lush outdoor patio, guests are welcomed with great wine, company, and greenery all around. 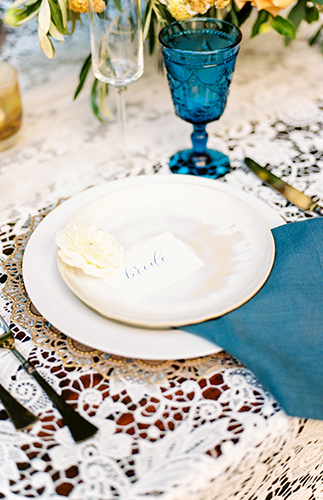 It makes for the perfect place to host a small reception party or rehearsal dinner before your big day. 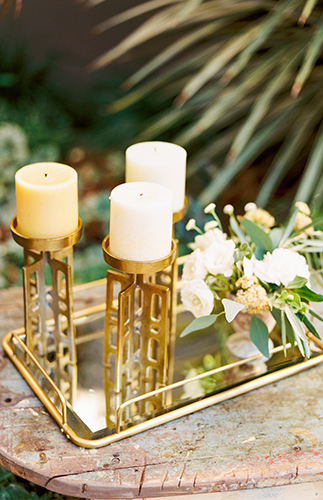 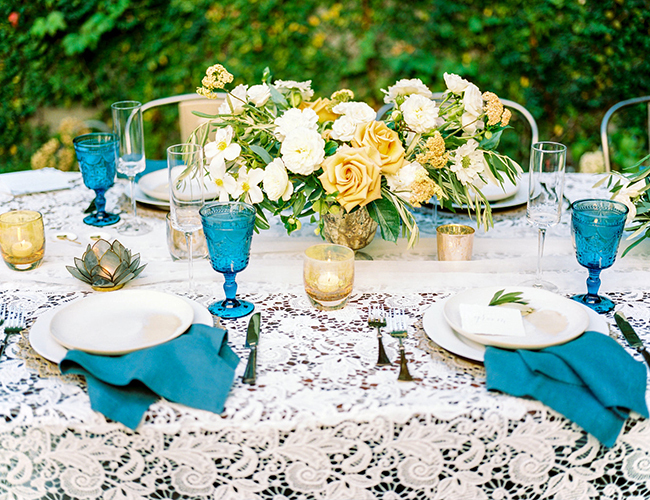 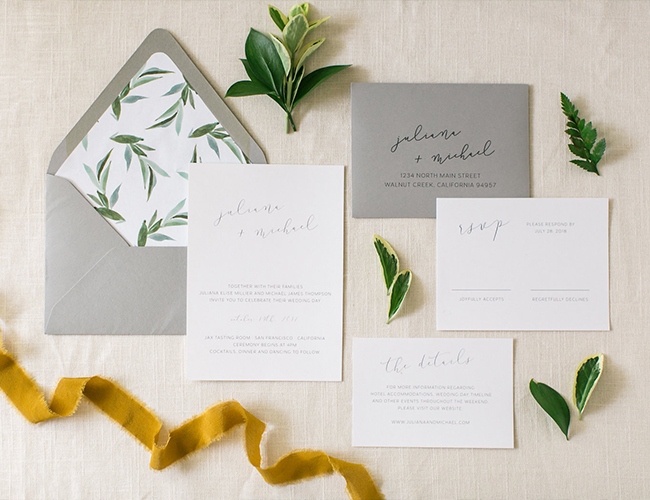 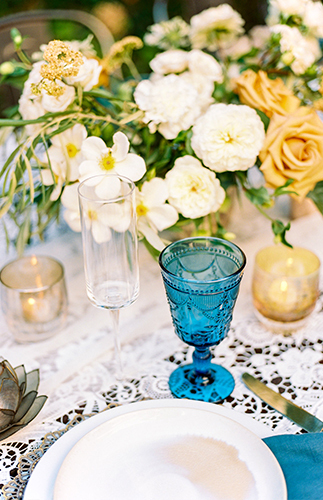 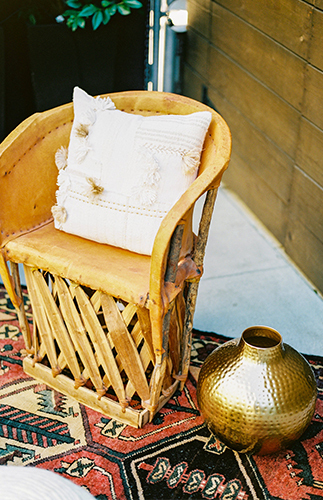 We wanted to design a tablescape that was golden, bright, and filled with texture. 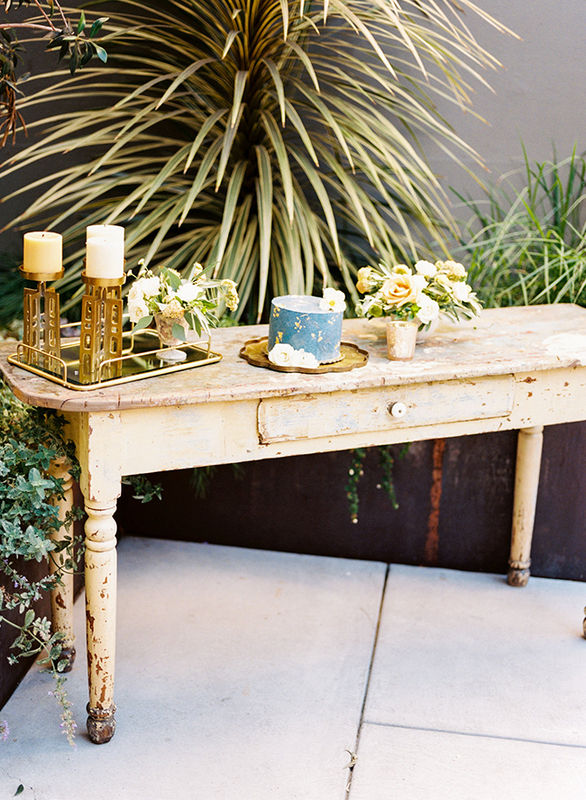 The goal was to create a romantic, urban feel that would be inviting to all guests of the bride and groom. 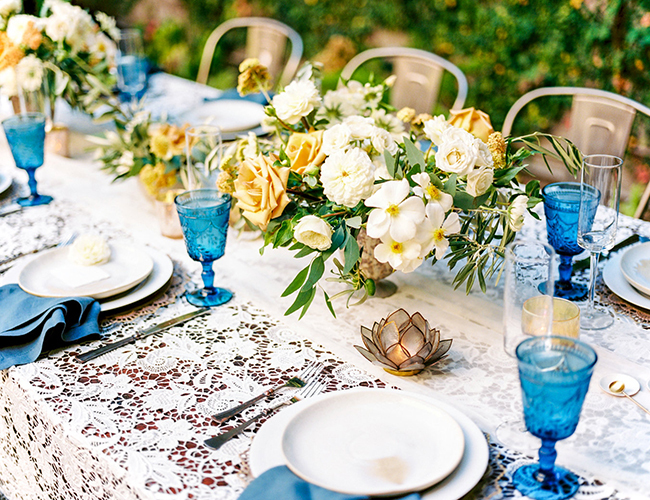 Combining deep blues and warm yellow tones, we played up the contrast of colors and metals throughout the venue’s space. 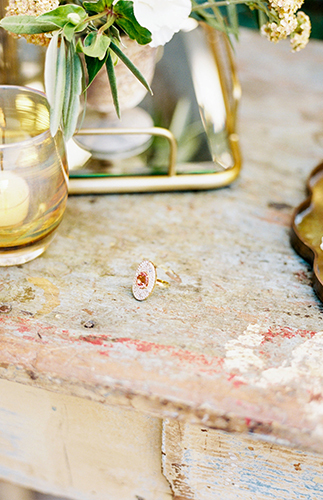 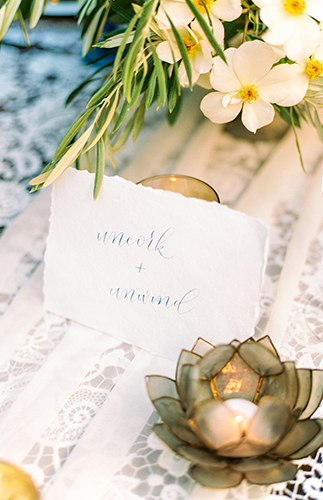 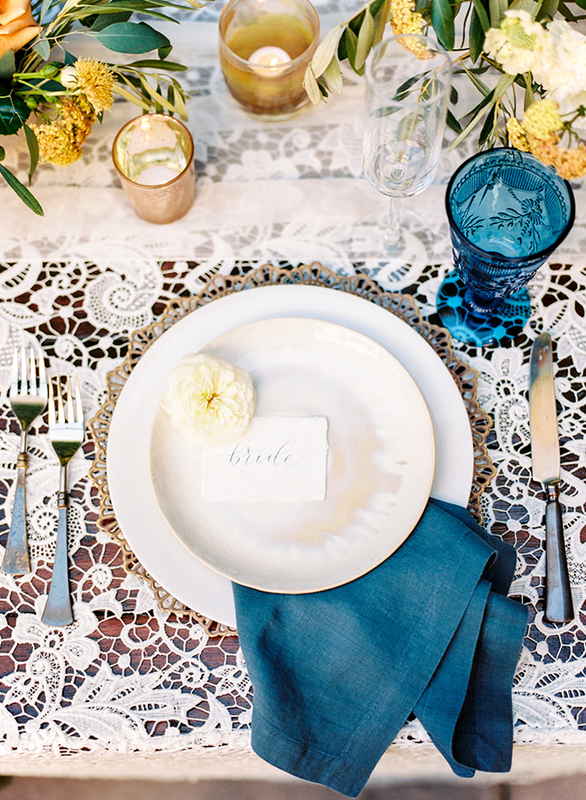 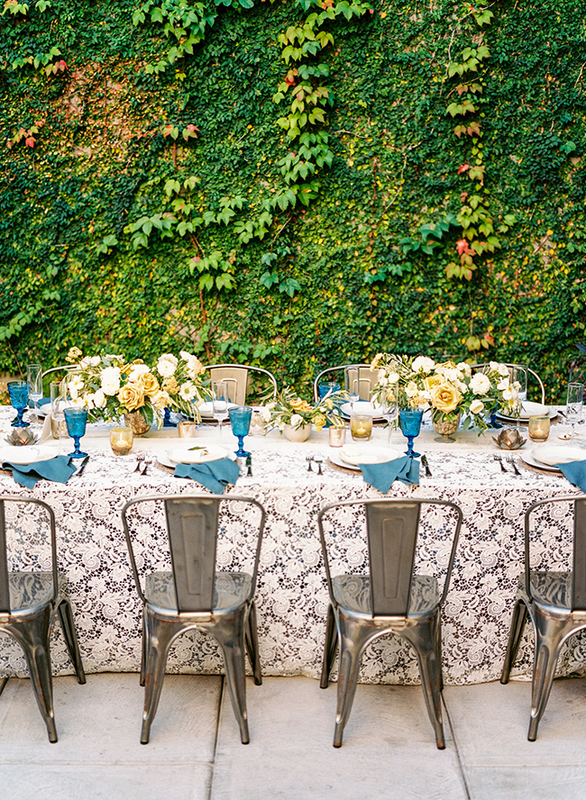 Dainty garden florals were paired with industrial, bronze chargers and flatware. 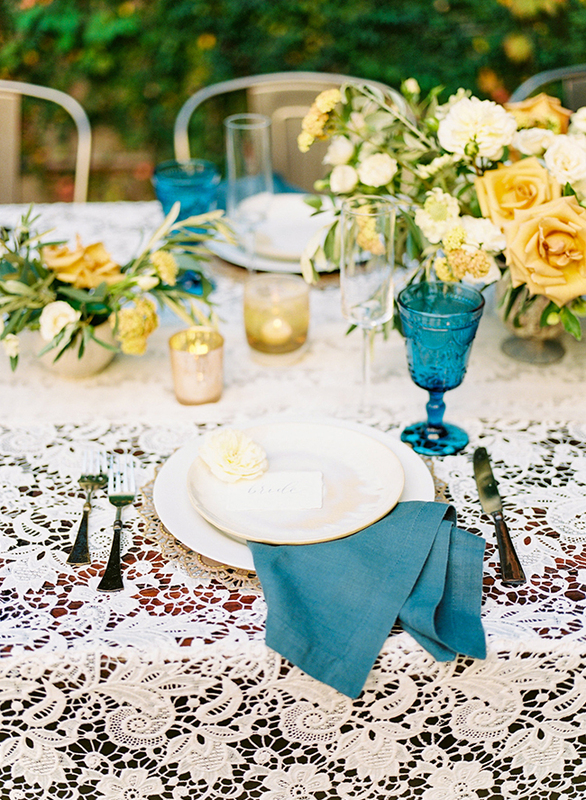 To complete the romantic atmosphere, we draped an ivory lace overlay from La Tavola and chiffon runner from Party Crush Studio. 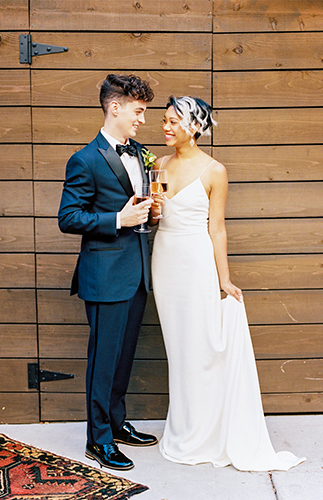 Our models, who happen to be recent newlyweds, could not have been more perfect for the shoot. 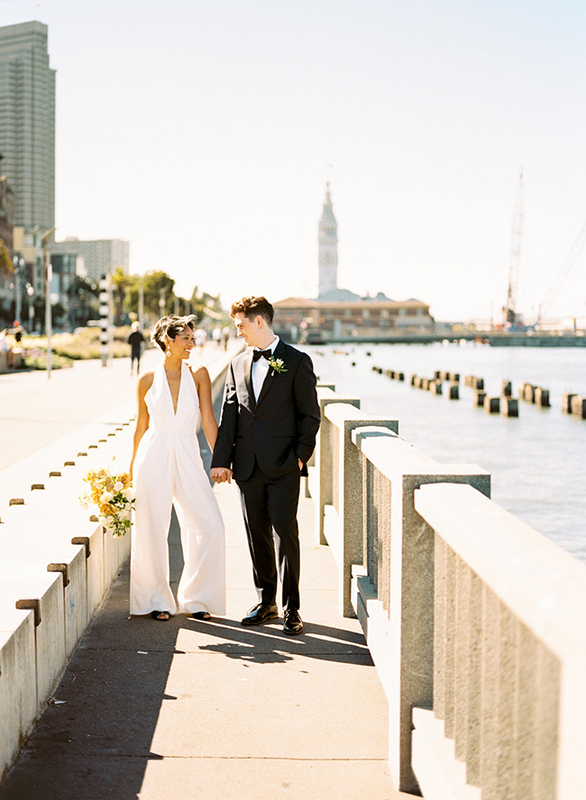 We wanted to keep a modern, city-chic look so we chose a slip gown from Lovely Bride and a blue suit from the Black Tux. 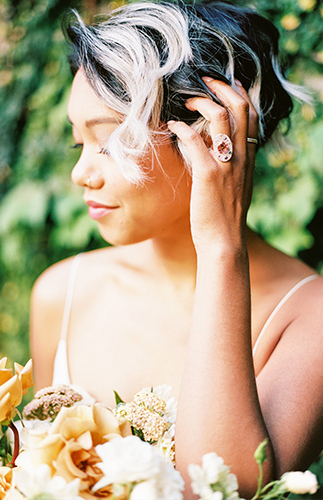 The garnet ring provided by Emily P Wheeler, a local SF jewelry designer, really sealed the entire look. 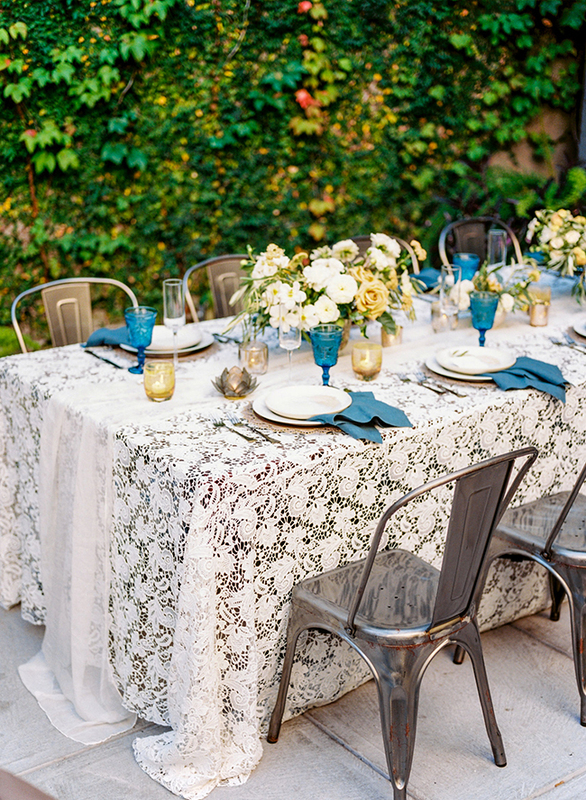 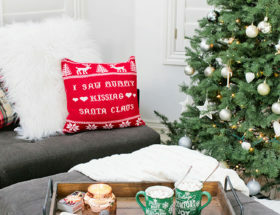 That table linen is stunning! 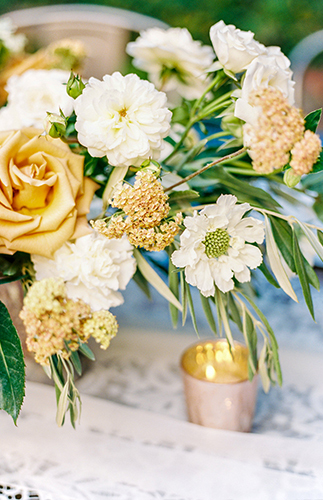 That gold bouquet is evvvverything!